Smashing Pumpkins to Make a Smashing 3D Movie - Rock Fuel Media Inc. 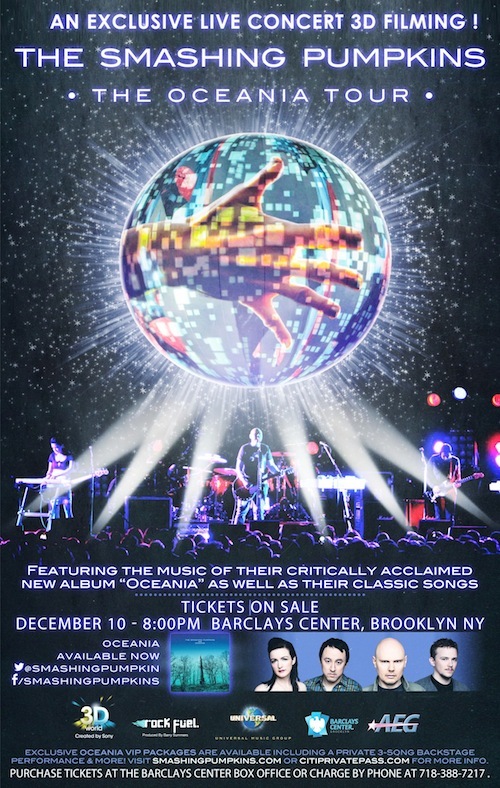 The Oceania Tour is going 3D at a filming at the December 10th show at Barclays Center in Brooklyn. More details inside! The Smashing Pumpkins will be creating a 3D movie of one of their most recent stops during their Oceania tour. Producer Barry Summers and director Milton Lage are heading up the project, and plan to show the movie in movie theaters, on TV, and a DVD/CD release as well. Check out the movie’s official Facebook page for tons of still photos from the concert, plus video clips, behind the scenes photos, and more. This announcement adds to many other band’s new 3D movies, including Metallica, Katy Perry, Justin Bieber, and Big Time Rush. Even after all this create content on the Facebook page, we still don’t know when the movie will be released. Dang!